I love the anticipation of a new camp! We're off to a new campsite! After our usual morning routine, I pack up the wire dog pen and go through all the steps to secure the BLT and to hitch it to the PTV. What a beautiful, sunny day. I’m so glad the wind has died down. We’re due at the gate of the BLM land at noon. Al of The Bayfield Bunch offered to meet us there, citing the difficulty and danger of parking next to the 65 mph highway, getting out to open the gate, and making a tight turn to fit through the narrow opening before closing the gate. Never turn down a helping hand is my motto. 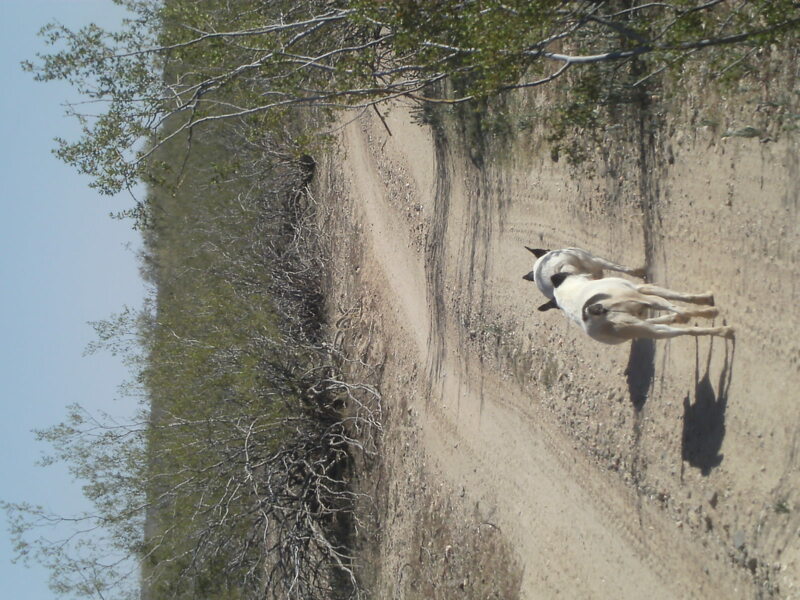 The BLM land is vast acreage next to the Escapee Park called North Ranch. Although I like the camp off of Ghost Town Road northwest of Congress, I want to become acquainted with and experience the larger BLM area south of Congress. Around 11:30 we pull into North Ranch and park near the dump station. There’s a spigot nearby with a sign that says, “Fresh water. Do not use to flush tanks.” The crew and I are down to our last jug of water. North Ranch is a clean, inviting place. The lady in the office is friendly and assures me the water is suitable for drinking. I ask about the sign that says the dump station is out of order and she says the sign is to make people come into the office first. It’s fine and will cost me, an Escapee member, only $2.50. I tell her I’ll be back for that task. I fill up ten gallon jugs with water. As the PTV carries us to the entrance of the BLM land I see Al is waiting at his appointed post. He opens the gate and we’re in! 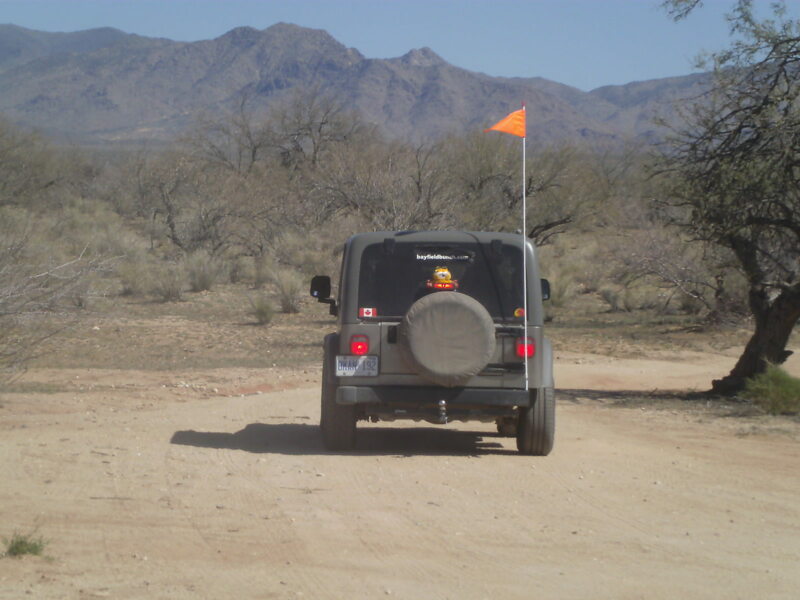 I follow his Jeep down the winding, sandy-dirt road over bumps and through a wash.
"Well, Bessie, there goes the neighborhood." We pass some curious bovines. Al leads me past his and Kelly’s campsite to a place he thinks I’ll like for a camp. I can tell right way it’s going to be a great new home! It’s away from the lane we drove over to get here, yet not too far. There’s a mesquite tree for the bird feeder and the ground is level. Wide open spaces spread out in all directions with mountains on the horizon. Al helps me back in. The BLT’s door faces the mesquite tree, and the refrigerator isn’t in the afternoon sun. Bridget and Spike are stunned to find themselves in this new place. Soon they’re made to feel right at home by the sight of Pheebs (Al and Kelly’s happy dog) bounding down the slope to greet his pals. Spike makes his usual squeaky noise to signify he’s thrilled right down to his toes seeing his canine friend. A few minutes later Al calls Pheebs over and together they walk up the slope to their camp. What a nice guy! After basic set-up tasks are completed, I tidy up the area, removing sticks lying about. I put out the patio mat and hang the bird feeder. I pour myself a glass of tea and sit in my camp chair to take in our surroundings. Bridget and Spike are wandering around off- leash, investigating their new home. Al says there aren’t as many coyotes here. In fact they never hear or see any. The vegetation is spread out enough to give a clear view far from the camp. Spike disappears around the other side of the BLT. He returns proudly carrying in his mouth a dried cow plop bigger than his head. “Oh no, Spike! No, no, no! Put that down!” He obediently lets it drop, walks over to the PTV, lies down by the back wheel, and looks very disappointed that I don’t appreciate the treasure he found. Before long he’s happy again. That’s because I make myself a cheese, lettuce, and mustard sandwich and let him and Bridget share a slice of American cheese. Cheese is their favorite snack! The crew loves a new camp to explore! We walk up some of the trails, not far, just enough to get the lay of the land. As I write this the crew is taking an afternoon nap. Bridget’s curled up on our bed and Spike’s flopped in his new bed on the floor. Looking out the window as I sit here typing this post, I see a house finch has found our feeder hanging from the mesquite tree. The crew and I are going to enjoy living here! 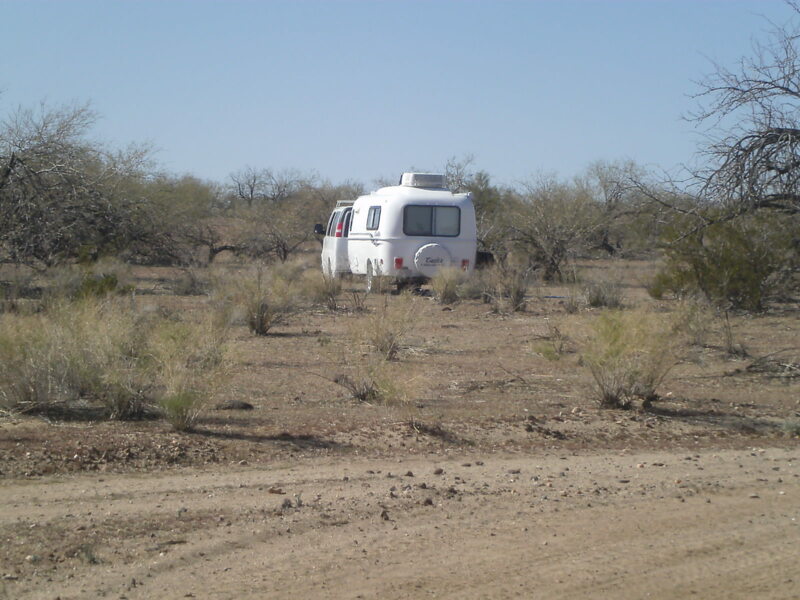 This entry was posted in Simple living and tagged Arizona, BLM, boondocking, casita, Congress, Escapees, fulltiming, North Ranch. Bookmark the permalink. yup.. .we stayed in that same spot last year this time… what a nice place~! (we crawled in there with a 40ft diesel motorhome!) Also we went over for one day of a beading class at North Ranch in the rec room. And it’s just a quick jaunt back to Wickenburg for supplies. We will go there again, for sure! Besides being a pleasant place to camp, like you said, it’s handy . . . North Ranch up the road offers water, dump station, propane, books, etc. and it’s a short trip to Safeway and other stores in Wickenburg. Omg I love the new place! “Yay.” I can hardly wait to head out myself and explore! “Honey, I’m Home.” lololol…. Good for you and the crew! Thanks for the welcome, CeCe! Hi Sue, didn’t you mean to date the expenses for MARCH instead of January? FYI, I got bored the other night and totaled up your expenses. Counting the ones listed today, you’ve spent $1439.51 for an average of $22.85 per day. I’d say you’re doing a GRAND job of living frugally in gorgeous places with enough fun splurges that you don’t feel deprived. Way to go girl. Thanks, Reine, for spotting my error. I went back and fixed it.
. . . A little over $700 out-of-pocket expenses per month. One of these days I’ll give you the figures for the other stuff like insurances and technology. Maybe by the end of the year I’ll have a handle on my finances! Actually, the numbers are $860.30 for January which included your neat purchases at Quartzsite, $404.95 for Feb. and $174.26 so far in March but that was a stock up grocery run that will allow you to go a bunch of days without spending any $$$.. I have all the numbers in a spreadsheet so I can add to them any time you get in the mood to post numbers. I know your ability to live on such a small budget is encouraging a lot of other folks that are afraid that they won’t be able to enjoy their retirement. It will be interesting to see how the numbers change as the year goes on. Reine! How thoughtful of you! I love the idea of my experiences and my blog encouraging others. Thanks for helping me. For sure. Your blog is very encouraging. It’s all attitude. Your posts help those who just need a bit more encouragement and positive feed back. You accomplish that very well. WooooHoooooo! Beautiful new place and fewer coyotes to worry about, abundant sunshine, house finches at the feeder and life is good! We are happy for ya Sue and Crew !!! Thanks, Geri, and I’m happy you’ll soon be firing up the Mothership. How’d the garage sale go? Garage Sale went great! Got rid of a lot of stuff! We should be ready to head towards Utah in about 6 weeks! My gypsy feet are a dancin” and ready to go! Waiting on a new grey tank to arrive so Chip can finish repairs! I think Spike has been listening to Motormouse! 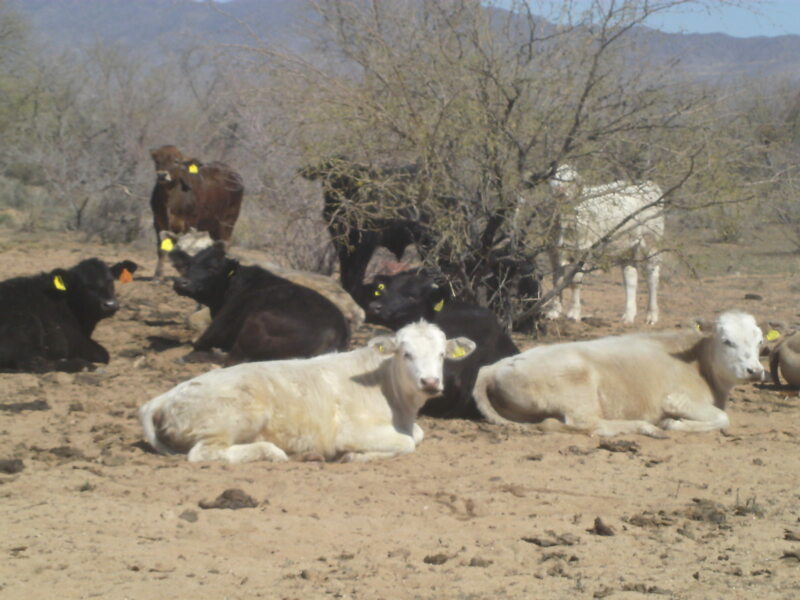 Don’t listen to her Spike…just because they are called cow “Pies” does not mean they are edible. A herd of cows just wandered up. Spike went crazy, barking, hair standing on end . . . I am really glad that Spike likes his new bed and you all like your new spot! Big shoutout to Al for his helping hand. Cathie . . . He may see your comment here. Al! We think you’re great! 3 big cheers for AL !!!!! YaY! YaY! YaY! Thanks for helping our friend !!!! I must have missed it, what is BLM? Can hardly wait for your scenic pictures when you go on your walks. Does it really look different than the other places you’ve been recently? BLM is the guvmint .. . Bureau of Land Management. . . so when I write about the BLM, I’m talking about land owned by the American public that is free to camp on. There’s a lot of it in the West. 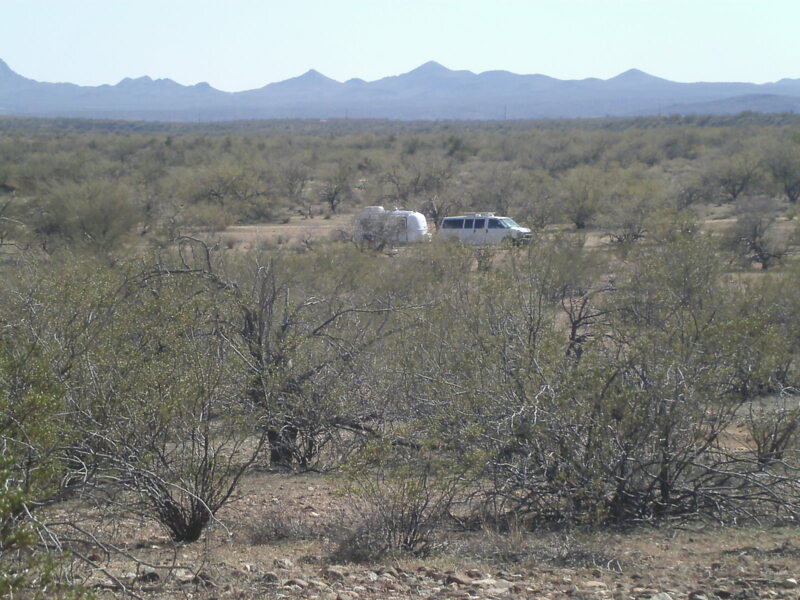 Any difference in scenery is very subtle as this camp is only a few miles from my previous camp. How perfect! Out in the middle of now wherel. No one in sight but friends just around the corner (so to speak) AND supplies close as well. How SWEET can it get? Laughing at Spike’s concern over the bovines. Wonder how long it will take him to relax? Poor Spike! He bravely stood his ground, back fur up, barking furiously. Those cows must have terrified him, but he wouldn’t show it. I picked him up to take him inside the trailer and his heart was pounding through his chest! Nice choice, except for Spike’s discovery. Will probably be quieter out there. Thank goodness that wind stopped and we’ve got nice sunny weather. It is quiet out here. Once in a while someone drives an ATV out this way, people from North Ranch. friends…..both for you and your sweet ‘furry’ companions! Always enjoy your posts. The “rv world” is full of helpful, kind, and interesting people! Al and Kelly are the latest of several, really nice people I’ve met on the road. Nice to hear what all you are doing today…and that you are enjoying your new spot. I find it interesting too when you tell what you are eating…wondering what it takes to manage storage of the food etc. Thanks for sharing your costs too…that is helpful!! I like getting feedback on what people want to read about. I’ll include stuff about food here and there in the future posts. I warn you, I’m not a gourmand! I have been enjoying your post for about a week now. I check every day and so excited when I see one. I love the pictures you post. Your furry friends are great! I am new here, looking to purchase a rv. I am going to be a single full timer very soon. Everything you say and do is such a help to me. Lets me have the confidence to know that I can do it too? Some day I will visit where you are….. I live in S.W. Florida. I love it here, but ready to travel. Originally from New England. I just can’t wait until I can travel like you do. Stay safe and look forward to your next post. You CAN do this and it will open up the world for you in ways you can’t imagine. I try to share what it’s like by writing this blog, but the experience is tenfold more wonderful! Good luck achieving your dream . . .
Poor Spike…bad Cow for scaring Spike. Love the new spot, and like so many other readers, beautiful, peaceful, yet good friends just around the corner. Its so good that you have met such awesome people on your travels, a big YAH for Al, and it sounds like Geri and his crew will be out again soon. Stay safe and enjoy, looking forward to your next post. Grin..:-).. Geri is me, a she! LOL! Chuck is he, my husband! We travel in The MotherShip! Hi, bearwise! Always a pleasure to hear from you! Sue, I have a question for you…. When the winds are howling outside, do you leave your solar panel up or lay it down flat on the PTV ??? Just wondering if it is stable enough in the “up” position to withstand the wind! Mick did such a great job designing the tilt support that it probably would hold up in strong wind. It’s easy to lower so if I had the panel tilted and it started to get windy, I’d lower it just to be on the safe side. I haven’t been tilting the panel because the desert sky is rarely cloudy and the ever-present sunshine keeps the batteries charged up with the panel flat on the roof. When I move to places with more tree cover and more clouds, I’ll use the tilt. I may not tilt the panel often, but when I need to tilt it, I really need to tilt it . . . gotta have that power! You’re right. However there are situations .. . such as Fortuna Pond . . . I wanted to be next to the water’s edge. It’s winter, the panel is shaded in early morning and late afternoon. Tilting the panel charged up the batteries big-time during the intervening hours. Check back in a year or two and I’ll be able to give more examples! If it’s not too intrusive, could you discuss what you carry in the big van? It seems like a great idea to have extra storage space but I wonder if one could live the same way with a smaller tow vehicle which may get better gas mileage? Sure, Rick! Before I do, let me explain that I’m still a newbie and some of the things I carry will be dumped if I don’t find them useful. I’ve already given a short stepladder and a stepstool to Goodwill as well as some clothing I realized I’d never wear in my new lifestyle. Ok, here goes to give you an idea . . . batteries, stepladder, tools, cushions I took out of the Casita, out-of-season clothes/shoes, duplicate clothes for when what I’m using wears out, camp chairs, lounge chair, patio rug, dog pen, air mattress, charcoal grill, briquets, inflatable canoe, paddles, life vests, air pump for canoe and air mattress, small cooler on wheels, broom, shovel, long-handled brush, old towels, auto maintenance supplies/protectorants/cleaners, two small folding tables, large box of miscellaneous stuff (clothesline, bug spray, cleaners, rubber gloves, electric plug adapters, you-name-it), fresh water hose, bucket, boots, wheel covers, back-up bag of dog food, jugs of drinking water, jug of distilled water, laundry basket with laundry supplies, bin(s) of canned goods, vinyl tablecloths, crockpot, a few extra dishes, soup pot, tent stakes, emergency air compressor, fix-a-flat, bungee cords, extension cord, and a whole lot more! When we get on the road, the PTV also carries the leveler blocks, wheel chocks, and cone for under the hitch. Also realize that the crew has a bench seat all to themselves as well as the area in front of the seat and between the driver’s and passenger’s seat. Space is also needed if a bag or two of trash is accumulated and also for groceries on the way home from the store. I LOVE having this huge closet. I need something . . . I go open the PTV. Any difference in gas mileage is overcome by this convenience. If I need something and have to drive to a store to get it because my vehicle can’t store it, a lot of savings is lost. Thank you for this great list!! We LIKE to learn from other people!! I appreciate the helpful list. It never occurred to me how much stuff a full-timer would want to carry along. I’m sure it’s helpful to be able to carry more, as necessary. A full-size van makes more sense now. You’re right about being able to carry more. I may find someday I want to have a screen house, for instance. The PTV is not loaded any higher than the bottom of the windows so I’ve got plenty of room. I like to keep the area for me and the crew free of stuff so we’re comfortable on long drives. I must admit it . . . Al did a better job of telling the story of our arrival here than I did. Go look at http://www.thebayfieldbunch.com for his post on this date and you’ll see what I mean! I”m still following your saga and enjoying your style and candor. Nice to hear from you, Bob! Thanks for letting me know about the recommend from akrvbob . . . I appreciate him doing that. Warm pats for Prissy and Fancy! Most of what is in the PTV was planned. After all, I had years to research and think about what to bring along! Some stuff wasn’t planned, of course, like the big ol’ seat/back cushions I took out of the BLT. I also didn’t realize I’d be filling jugs of water. I thought I’d be drinking from the fresh water tank. Once on the road I didn’t feel good about drinking from the tank . . . Guess I don’t trust my sanitizing enough to provide good-tasting water. I use tank water for toilet flushing and occasional washing/showers. That way it lasts longer, too. I use gallon jugs for drinking water, washing dishes, and sponge baths. Ten of them takes up a lot of space. It’s easier to get them filled than the on-board tank. Hi Sue! I love the long view of your new desert campsite. It gives some scale to your world. Just wanted to let you know that WREN is finally on the road! 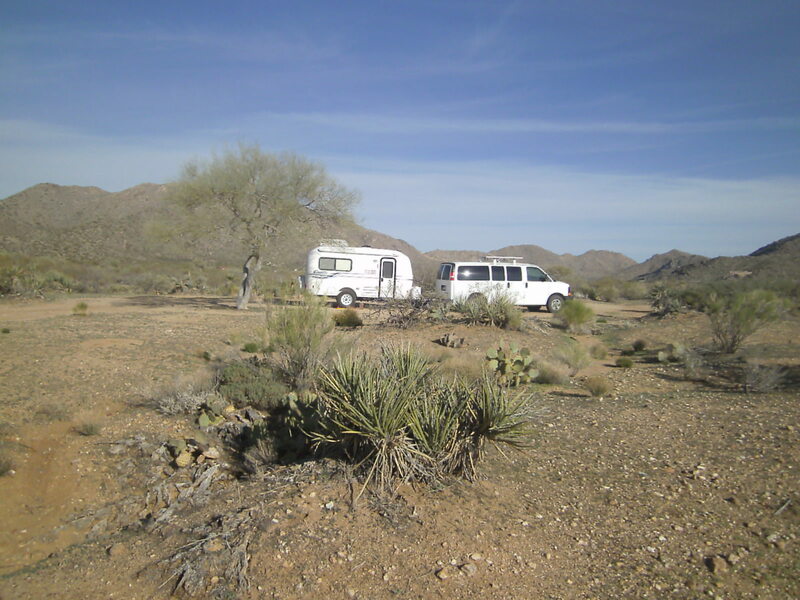 We’ve just set up our camp at Falcon Dam State Park further NW in the Rio Grande Valley. The dry, scrub vegetation here reminds me of your Arizona site. I feel like I’ve been cocooned in our cozy little home. You must know what I mean, Sue. I’ve never felt so relaxed and peaceful. This is the camping life I’ve been waiting for. Oh, Hazel . . . Your happiness and satisfaction with your WREN lifts right off the page! Yes, I know exactly what you mean. . . the relaxed and peaceful aura, the enjoyment of managing your daily tasks in a simple way . . . It’ll keep getting better and better. I’m so happy for you!